There are rumors circulating that say we'll see more new handsets from the Moto brand before the year is out, and the latest image leak claims to give us a look at the notch-heavy Motorola P30. Picked up by AndroidPure, the 'official press renders' of the unannounced Motorola smartphone bear more than just a passing resemblance to Apple's iPhone X. The first obvious likeness is the notch at the top of the screen. While the likes of the Huawei, LG and OnePlus have embraced a smaller notch than the Cupertino-based firm, it appears that Motorola's next phone will almost mimic the flagship iPhone. It's not identical to the iPhone X from the front however, with a 'chin' bezel at the bottom of the handset revealing that the Motorola P30 may not be quite as accomplished as its iOS-toting muse. There's more though, as on the rear you'll find a vertically stacked dual-camera module which again, is similar to that of the iPhone X. 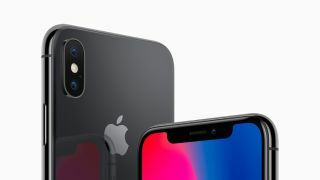 If this leaked render is accurate, the Motorola P30 could well boast a feature the iPhone doesn't - a fingerprint scanner, which appears to be located on the rear of the device. The leak also claims that the Motorola P30 will come with a 6.2-inch, 19:9 display, an octa-core processor, 6GB of RAM, 16MP + 5MP rear cameras, 12MP front camera, a 3,000mAh battery and two storage options: 64GB and 128GB. A previous Android Pure rumor suggests it's not just the P30 we'll see soon either, with a P30 Note and P30 Play also tipped for arrival. It's not clear where these renders came from, so it's worth taking them with a pinch of salt, but they do look relatively official and parent company Lenovo has a press conference lined up for IFA 2018 at the end of the month where we could see new Motorola handsets launched. We'll be reported life from IFA in Berlin, Germany to bring you all the latest from Lenovo, Motorola and all the other brands announcing exciting new tech at the show.